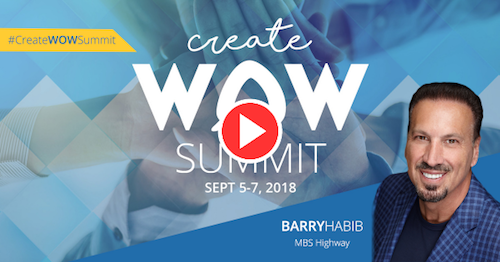 SocialSurvey’s #CreateWOWSummit—the highly anticipated “unconference” coming to Bishop Ranch this September 5-7th in beautiful San Ramon, California—is continuing its #CreateWOWSummit Speaker Spotlights to give attendees a preview of the WOW experiences to come. SocialSurvey had the great pleasure of speaking with legendary mortgage professional, Barry Habib, founder and CEO of MBS Highway. Barry has been the top loan officer in the country twice, having personally originated over $2 billion in loans closed. He was named “Top Real Estate Forecaster” by Zillow and Pulsenomics, has regular appearances on Fox News and CNBC, and is even lead producer of the hit Broadway musical “Rock of Ages.” Now that’s creating some WOW in the world! Watch the video here or download the transcript here. Barry spoke to us about how to be “always worth waiting for”, why a “unconference” is serious business, and how to build a “financial culture”. Learn secrets that have made him a superstar many times over. Stay tuned for more #CreateWOWSummit Speaker Spotlights from our power-packed lineup: Barry Habib, Dennis Yu, Logan Young, David Lykken, Rick Sharga, Eddy Perez, David Kawata, Blake Boyer, Jon Gwin, Rick and Patty Arvielo. And if you missed it, here’s The Mortgage Coach, Dave Savage’s interview, and The Real Estate CIO/Agent Marketer, Jason Frazier’s interview. Register today for SocialSurvey’s “unconference” at CreateWOWSummit.com.